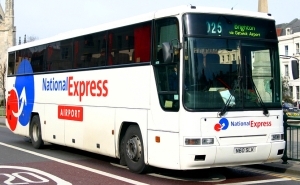 Catching a National Express coach is the cheapest way of getting from London to Paris (they keep their prices pretty constant over time at £34). Average flight prices have gone up over the last week, almost to the record level of flights on the 28th July ). Now, is not a cost-effective time to fly from London to Paris. If you take the National Express coach, it will take you 12hrs (including a 100 minute wait for a ferry at Dover for a ferry port).